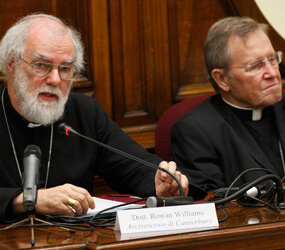 VATICAN CITY – Archbishop Rowan Williams of Canterbury, spiritual leader of the Anglican Communion, said the ecumenical situation really is that of a “glass half full,” and he held his water glass up to emphasize the point. In the wake of Pope Benedict XVI’s special provisions for Anglicans who want to leave Archbishop Williams’ flock and join the Roman Catholic Church, his assessment of Catholic-Anglican relations seemed to surprise some people in the audience when he spoke in Rome Nov. 19. But people seemed less surprised when his remarks about what the next steps in ecumenical dialogue should be included several blunt challenges to the Catholic leadership and its theologians. 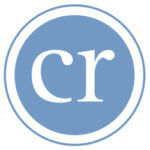 Anglicans and Roman Catholics – indeed, all Christians engaged in ecumenical dialogue over the last 40 years – really need to ask themselves if the doctrines and practices still dividing them are anywhere near as important as the essential dogmas they share, he said the evening before beginning a series of meetings with Vatican officials and with Pope Benedict. Among other issues, the archbishop and Vatican officials were expected to make final preparations for the third round of the formal Anglican-Roman Catholic International Commission, the official group for theological dialogue. “When so very much agreement has been firmly established in first-order matters about the identity and mission of the church, is it really justifiable to treat other issues as equally vital for its health and integrity?” the archbishop asked. Archbishop Williams challenged the Vatican’s view that the ordination of women as priests and bishops in some provinces of the Anglican Communion marked a definitive barrier to any form of Catholic-Anglican unity. If, as the churches have agreed in their ecumenical dialogues, individuals are ordained to serve the church, to promote holiness and to reconcile believers with God and with one another, “how much is that undermined if individuals within the ministerial communion are of different genders?” he asked. Pope John Paul II declared that the Catholic Church has no authority to ordain women because Jesus chose only men as his apostles. Archbishop Williams said he did not want to review all the arguments for and against ordaining women, but he said that “for many Anglicans, not ordaining women has a possible unwelcome implication about the difference between baptized men and baptized women,” a difference that is not made in any creed or fundamental statement of Christian faith. The Anglican leader said the disagreements within the Anglican Communion over ordaining women obviously have caused internal tensions, but Anglicans still are seeking ways to preserve their unity without forcing those who have opposing views out of the communion. “And if it can be managed within the Anglican family, is this a possible model for the wider ecumenical scene?” he asked. Those responsible for ecumenical dialogue and the life of the Christian churches must ask themselves if remaining differences regarding ministry and authority in the church “have the same weight” as the agreements they already have reached on fundamentals of faith. Cardinal Walter Kasper, president of the Pontifical Council for Promoting Christian Unity, also spoke Nov. 19 and affirmed the Catholic Church’s commitment to continuing the search for full unity. “Ecumenism has a future, not because we want it, but because Jesus Christ wants it and because his spirit helps us in our commitment,” he said.